Georgia Aquarium, one of the must-see attractions in the city, was recently confirmed by Guinness World Records as "the largest aquarium in the world." During a visit you can find Nemo, pet Jaws and sing along with a 3,000-pound canary, a "sea canary," that is. The massive building is easily identifiable by its ship-silhouette design and the G-shaped Georgia Aquarium logo near the "bow" of the structure. It’s conveniently located near downtown Atlanta, immediately adjacent to Centennial Olympic Park and has ample near-by parking, but arrive early during high season to avoid longish lines. An annual membership reduces or altogether eliminates having to wait in line and it pays for itself in only two visits…worth the investment, especially if you're a local. 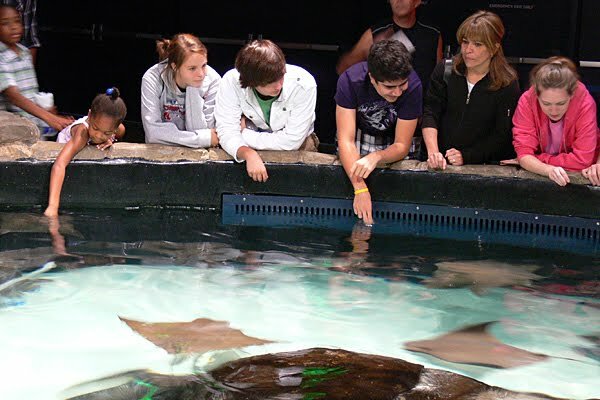 Once inside, the Aquarium features five galleries that teach and display aquatic life ranging from oceans to rivers. There’s also a café for the hungry, gift shops for those in need of retail therapy and special exhibits to keep visits to the Aquarium new and exciting. 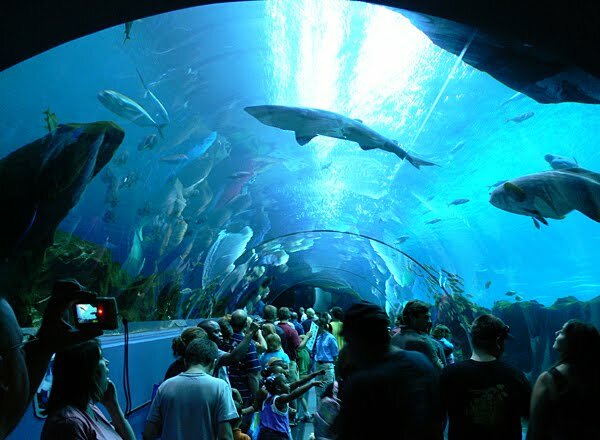 Before I get too much further into what to expect when you tour Georgia Aquarium, let me explain the Nemo, Jaws and canary remark in my introduction. The star of Finding Nemo, the 1995 Disney/Pixar movie, was a young Clown Fish named Nemo. Clown Fish are one of the more than fifty aquatic species found at the Georgia Aquarium. The reference to being able to "pet Jaws" is not too much of an exaggeration. Probably the most popular exhibit in the main atrium of the Aquarium is a petting tank filled with sharks and rays. They’re perfectly harmless—the Aquarium would obviously not endanger visitors or its residents. I was amazed at the bravery of so many children and teenagers who reached in and pet the sharks…maybe they never heard the "Just when you thought it was safe to go back in the water" tagline from the Jaws 2. I jest, of course…it's a very cool experience to be able to pet creatures that would make many people at a beach swim away as fast as possible screaming at the top of their lungs. What’s a "sea canary" you ask? 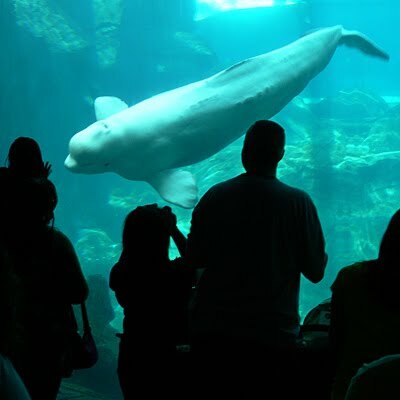 In this instance, I'm talking about the two main stars of the Georgia Aquarium…Beluga Whales. Weighing in at as much as 3,000 pounds, Beluga Whales are also referred to as sea canaries because of their twitter. No, these whales are not posting 140-character status update using social media; the twitter I speak of is their whale song, the way they communicate. From time to time, the Aquarium will play their whale song so that visitors can hear what they sound like under water—maybe one day we'll know the words so we can actually sing along. 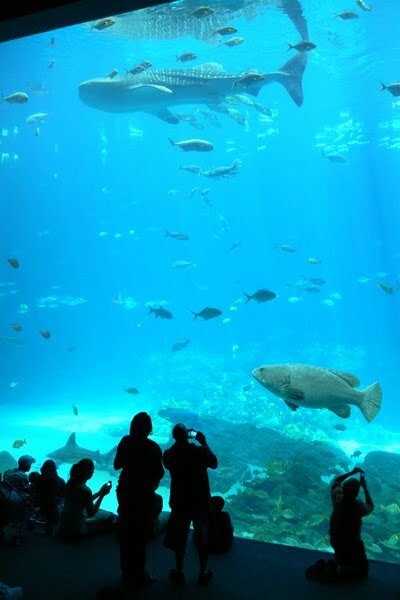 On this visit and previous visits, I headed directly for the 100-foot-long underwater acrylic tunnel to get an immediate sensation of sharing the ocean with thousands of fish who live at that Aquarium. Seeing the kids' eyes darting from one fish to the next totally augments my sense of awe and wonder and what an incredible spectacle provided from within the tunnel. You even have options for traversing the tunnel. You can stand on the moving sidewalk and feel as though you're floating through the ocean or walk on the other side at your own pace. 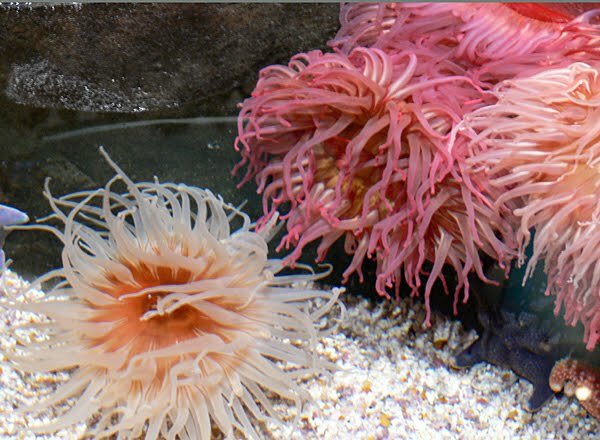 In addition to the shark and ray petting tank, there's another that houses brightly colored sea anemones. Aquarium staff members are present to explain what to expect when touching one of the creatures and also to ensure the anemone get an occasional break. While I was there, I passed by a kiosk with the red and white diver symbol. My curiosity got the best of me…I had to know more, even though I’m not a diver. As it turns out, the Aquarium offers dives and swims with their sharks and whales and multitude of other sea creatures—Journey with Gentle Giants. Professional divers participate to ensure the safety of visitors and the safety of the sea life. A friend recently told me that she and her daughter did the swim and thought it was an amazingly incredible experience and that they're thinking about going again. I can hardly wait…this is definitely a rare and unique opportunity! The Aquarium is about more than just fish. They host special events including the currently running Antique Car Show. Most of the cars in the exhibit are housed in one of the ballrooms, which have large window looking into the immense tanks—an incredible space for special events. Next month is the 5th Annual Aqua Vino event featuring tastings of more than 200 wines and cuisine from 30 top Atlanta restaurants. Georgia Aquarium's aquatic residents, architectural marvel and friendly staff fascinate and entertain millions of visitors every year and absolutely worth a visit! There are quite a few special events, behind the scenes tours and learning programs for kids of all ages…truly something for everyone. Hours: Open 365 day a year, with some exceptions hours are Sunday-Friday 10 a.m. – 5 p.m. and Saturday 9 a.m. – 6 p.m.
Last time I went through an aquarium, I was moderately intoxicated. I said to each fish: You would taste good with a bit of soy sauce and wasabi. They quaked in their boots.